Are you traveling soon and want to pack light? 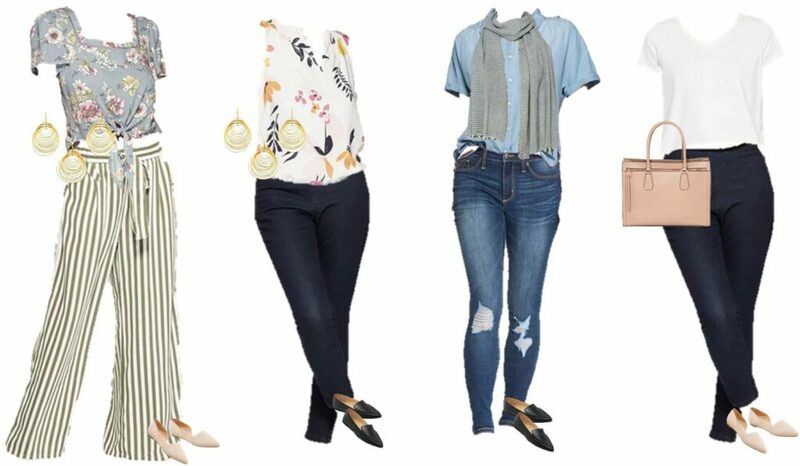 We put together a casual capsule wardrobe from Target so you can mix and match your options. 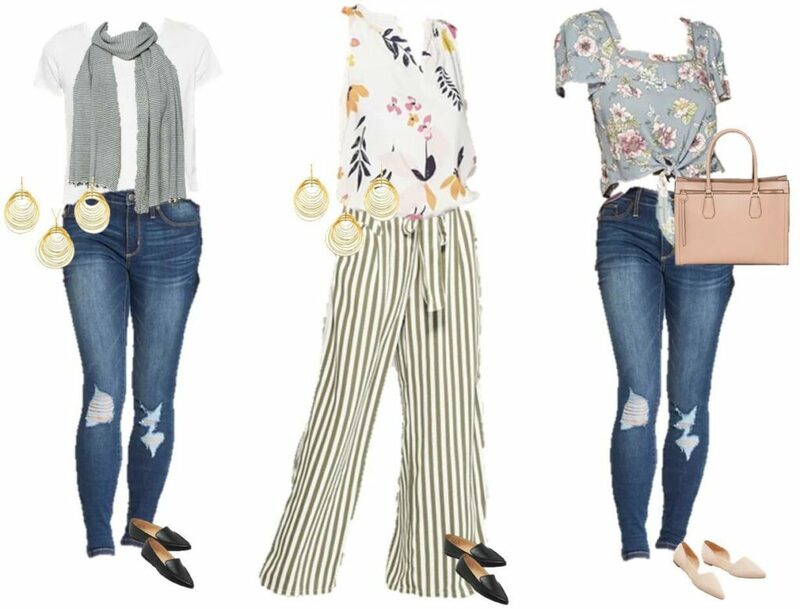 Now you can look put together every day of your trip without overpacking! Traveling, and the packing that goes with it can often be a mad rush of last-minute scrambling and hoping you remember everything. Or it can be organized and done well. Here are some tips and tricks that we have found to be helpful. Personal beauty items – shampoos, makeup, etc. You can add to your own list. It helps reassure you that nothing major gets left behind. I found a great printable packing list at SmarterTraveler.com. Roll your clothes instead of folding them can mean getting more into a small space. Plus you can roll outfits together saving time matching up items. 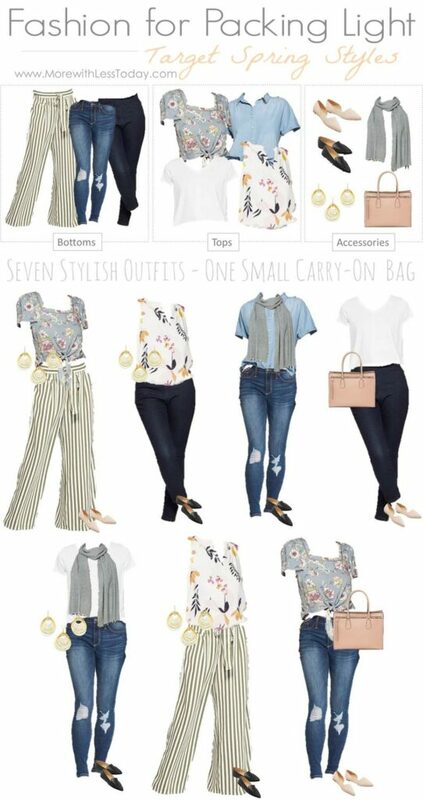 Only taking outfits that are coordinated can cut back on what you take as well, that is why we love the concept of a capsule wardrobe. Take essentials with you in a carry-on. A small zipper pouch works well for medications, hand sanitizer and more. Keep your charger and other necessary electronic accessories with you. I also recommend taking toiletries and one outfit that you would need for a day or two in case your luggage is lost or delayed. Traveling is the perfect time to take those trial size products you have accumulated. Get freebies when you can – ask your dentist for toothpaste samples or your hairdresser for shampoo samples. Snack size baggies are perfect for individual jewelry and toiletries. in bigger ones and not worry about leaks or spills. Toss in a few extra ones for down the road. I like to take a bag for dirty clothes too. What items do you typically forget when you travel? For me, it’s toiletries and beauty products. I usually find myself in a CVS soon after I arrive. My friend Heidi is a frequent, frugal traveler and she keeps a separate set of toiletries always packed. Pack snacks such as granola bars, instant oatmeal, nuts, and trail mix that can tide you over if you have a long layover or get in late at night. I stop at Trader Joe’s before a flight and stock up on food for a meal on the airplane. It is healthier and cheaper than the options at the airport. You can make a cooler in your hotel room with a trash can, a plastic bag, and some ice from the vending machine. Stop at a grocery store when you arrive and buy some fruit, water, and a few other staples so you can have some meals in your room. I make a copy of my itinerary and give it to someone who is not traveling with me. I leave behind any credit cards I will not need and also make a copy of my travel documents and passport. With a little preparation, you can pack like a frugal traveler and have extra money to spend at your destination! What packing tips do you have to share with us?